Everyone here at the Small World wants to wish you and yours a very merry Christmas. It's been an activity packed season: sometimes frantic and exhausting, but also a time of great joy watching our children participate in the wonder and magic. We feel so blessed by all that we have, and for the time that we get to spend together and with our family at this time of year. We wish for you joy, love, and wonder now and in the new year. Thank you for reading and for helping us celebrate. E..., J., O. & N.
One of the highlights of counting down until Christmas for O. this year has been the Playmobil advent calendar my parents bought him. Each day has a little window to open, with a different toy inside to add to a woodland scene. Some days it is a tree or a piece of food for an animal, and other days it is a little forest friend. Favorite discoveries have included the fox family, a couple of raccoons, and a buck, just like the one we had in our woods one morning this December. Each morning, as soon as he opens his eyes and jumps out of bed (before he even hits the potty), O. heads right to this table in our upstairs hallway and looks to see if he can figure out which little window to open. The first ten days, he could do it on his own, but since then he's had to come find out from me what numbers to look for. "Fifteen. One. Five. What do you think it will be today, Mom?" After showing N. what he found (and reminding her she can't take the pieces downstairs), he arranges each piece just so in the scene. He consults the box it came in to decide where it should go, and then carefully sets it up. He can't wait until after Christmas, when he'll have the whole scene to play with just as he wants. The anticipation each night has been powerful, but he's been very good about not opening more than one each day. "When I wake up today, can I open another one on my thing?" he asks in bed each night. This morning he said, "Only two more days left. I think Santa is in the last one! It's gonna be great!" Speaking of countdowns, ever since I can remember, my father has been impatiently counting down the years until his retirement. While he is excellent at his job, and has had much success, he has weathered many changes through his years working for the same company. If you asked him what he wanted for a gift on a particular occasion, he would say "retirement". This Christmas, he's finally getting that gift he always wanted. Yesterday was his last day of work. On January 1st, he will be officially retired. Congratulations, Dad. Your freedom and time to relax is much deserved. Here in the Small World, we look forward to spending even more time with you in 2010. ...we decided to put together our gingerbread house!! The kids were very excited about this. Building, cooking, cookies and candy are all high on their lists of favorite things. 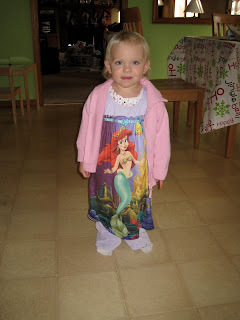 They even asked to put on their aprons to be properly attired for the event. Look at us all decked out and enthusiastic. And wow! Is that an actual photograph of me??? Thanks, J., for taking it. I notice you slipped off to your office pretty quickly afterwards, though. Did you pick up on the feeling of foreboding? Because here's the thing. I told myself I was going to LEARN from last year's gingerbread escapade. I reminded myself NOT buy the pre-assembled version of the kit. Because when we did that last year, it was broken, and we had to put it back together anyway. For some reason, that's the only part of the difficulty I remembered. So, when I purchased this year's, I wasn't thinking "Don't buy the WILTON one. It's the one that requires you to be a cake decorating EXPERT, not a mom trying to entertain preschoolers." That's what I SHOULD have been thinking. Instead, I was thinking. "Nine dollars? Cool. I have a Jo-Ann's coupon. That will work. It's not the pre-assembled one, so it won't be broken this time. And how on top of things am I, buying this in early November? I basically rock as a mom." I bought the Wilton, unassembled one. The one that not only requires you to glue the house together with icing, also requires you to make that icing out of the powdered sugar bag they give you labeled "icing mix." This year, I followed the directions as written, making my icing a toothpaste consistency, remembering that I didn't want a pool of thin icing all over my table. Well. Toothpaste doesn't exactly flow out of a decorating bag. Especially one your son has threaded through the included decorator's tip. Although he did widen the hole for the icing in the process. Also, when you have to assemble it yourself, you're supposed to wait three hours or so for the icing to set before you can actually do the fun part of sticking the candy on. Oh, the other parenting fail? All of that candy is candy that was "Made in a Facility that Processes Peanuts." Says so right on the outside of the box. Good one. By the time I got to this point, the kids had long since lost interest and were busy hiding in their tent coloring with the non-washable markers. I set it aside, and still had to hot glue it together because half the roof fell off an hour later. Here's the beauty part, though. On that November trip to Jo-Ann's, I had also picked up this adorable little gingerbread house. It is not edible (therefore not allergen laden). It is made of foam. And wonder of wonders, they are the foam pieces with the sticky stuff on them, so we didn't even have to use glue to construct it! They actually worked together reasonably well to make this little guy. We did eventually put the candy on the real house. And I let them go to town the next day eating the candy. I know, I know. I shouldn't have let Little Peanut eat the candy. But it would have been awfully cruel to tell her no way, you cannot eat that candy right in front of you, none of it had actual peanuts in it, and the epi-pen was on standby. but I think this guy looks more than a little creepy. Also creepy? The fact that he supposedly pops in and out of your house at random, spying and such. I mean, I'm not proud of some of the screaming that has occurred in the name of Christmas craft fun around here in the last week or so. Not sure I really want Santa in on all of that. But, creepy or not, where is my freaking elf when I need him??? I offer you exhibit A in the case of "we need a little help staying on the nice side of the list around here." No, that is not blood. That would be SILLY PUTTY. So, with just a few days left until the big day, I'm asking you, dear readers: any suggestions? Sure, if you have any on how to get silly putty off of a shirt, that would be great. However, to be honest, the shirt only cost three dollars. How much stain removal is it really worth? I may make him wear it as is. More to the point, I do not have TIME for this sort of incident, or the rest of the Amped-Up-On-Christmas-Cookies-And-Anticipation naughty behavior. There are presents to be wrapped, cookies to be sprinkled, JOY to be made, for elf's sake! "Santa is watching, and he is SO not happy" is starting to wear thin, and besides, I'm pretty sure my kids think Santa is way nicer than me and probably a little lax on the follow through. So, I ask you, what do I do? Bring out the big guns and name drop Blitzen?? I don't think I can let this Christmas countdown go by without discussing N's devotion to the main reason for the season. That is, the Baby Jesus. She is just enthralled by him, has been ever since she became attached to our paperback book version of Silent Night. Of course, she's always had a thing for babies. Unless of course, it's me holding a real one. She adores baby dolls, and points out real babies everywhere we go. But Baby Jesus gets extra special attention. She has checked out all the creches in all the homes we've visited in December, commenting on the differences in sizes, and whether or not you are allowed to touch and play with these scenes. She was surprised and delighted to see that a friend had the same Little People set that we do at our house. Ever since she saw the set in the sanctuary at O's school on the night of his Christmas program, we've had to make a detour past it after dropping O. off at school. "See Baby Deezus, Mommy?" Seriously, how can you turn that request down? When we went to Krohn Conservatory to visit the live nativity scene there, she could barely contain herself. "Oh boy, gosh!" she said. "N. wuv Baby Deezus. N. wuv Baby Deezus." She kept repeating it to herself even in the car on the way home. Later, she told my mom all about it. "Mamma. Baby Deezus. Deezus Mommy. Deezus Daddy. And amimals there. Donkey, cow, and heep. Heep say Baaaaaaa! Dose heep LOUD. Dose heep hunny!" ...We got our first real snow of the season. Apologies for those of you getting hammered with the blizzard in the east, and for those of you in the north already sick of snow. Here in southwestern Ohio, we are as likely to get ice as anything else. 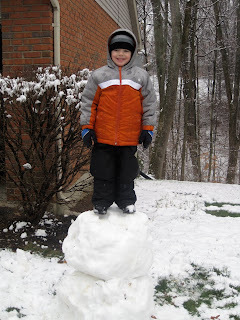 So real, stick-together-make-snowballs-and-snowmen-snow is something to celebrate! However, Frosty didn't last long. O. hauled off and knocked his head off about one minute after the above picture was taken. J. told him Santa probably had just moved him onto the naughty list, so I guess he decided to go for broke and play king of the mountain. 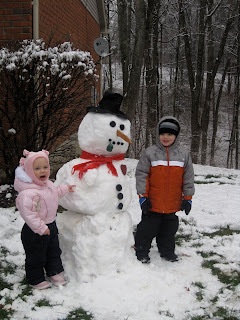 Mr. Snowman got the last laugh, though. The Small children went to see Santa. Actually we've seen Santa around a lot of places this year. Is it me, or is Santa a lot more mobile these days than when I was a kid? I keep waiting to discuss "Santa's helpers" with O., but that conversation has yet to come up. Last weekend, my parents volunteered to take the kids to the train display at Cincinnati Museum Center while J. and I went to the biggest rivalry game in the city: the basketball game between Xavier University and the University of Cincinnati, otherwise know as the Crosstown Shootout. We were pleased to see XU emerge with another win. However, it is official: we are old. When the second overtime looked imminent, we actually didn't care if the Bearcats took the win, we were just really hoping to go home and get some sleep. Anyhow, while we were at the game, the kids and Grandma and Grandpa looked at the trains, and Santa happened to be visiting. N. told Grandma that she wanted to go "hug Santa." So, they waited in line, and my dad walked her up to him. 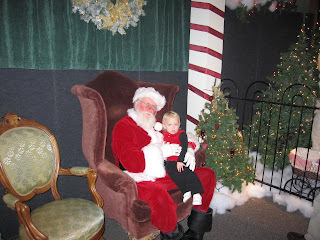 Santa made her feel so comfortable and welcomed that she had no problem sitting up with him and having a chat. I think she told him she wants him to bring her some candy and farm animals. O., on the other hand, was not feeling quite so friendly. 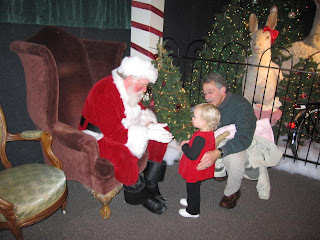 However, it was clear he was interested in talking to Santa, because he stood just beyond the velvet ropes taking in the whole interaction with his sister. 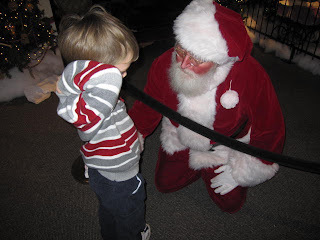 When Santa recognized N's brother standing there, he got up and came over to talk. My mom tells me they chatted for a good long while. O. kept his arm just like that the whole time, just as he does anytime he's particularly nervous. The next morning, O. was very excited to tell met that Santa told him he thought he was going to be very excited about what he found under the tree on Christmas morning. Maybe even some dinosaurs!! Does Santa know exactly the right things to say to kids, or what?? I should mention here that there was no photo booth set up anywhere near Santa's chair here, no teenager dressed as an elf, nothing available for purchase. Just Santa having a nice long chat with each child, making sure he knew exactly how he could make each one's Christmas as special as he could. When O. wrote his letter to Santa, he started off by listing his top desires this year: a racetrack and the Triceratops Dinosaur mountain. He also added that he has always wanted a big truck that he can drive himself, and he wanted Santa to know that even though his Mom says Santa usually only brings toys that make kids get exercise and use their imagination. He also told Santa that his sister would probably like a baby and a pony, and he thinks Santa should bring her her own pink rock so that she doesn't keep trying to take his. When I mentioned that perhaps he should ask Santa a few things about himself, since just asking for toys wasn't very polite, he added a question to Santa wondering how reindeer really do fly. For the next few days, he kept asking me when he would hear back from Santa. Luckily, Santa does know exactly the right things to say to kids, because shortly after, O. received a great video message directly from Santa. 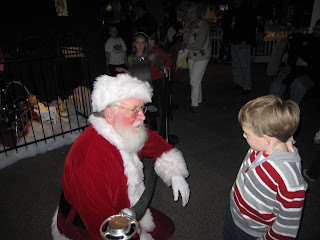 It came from the Portable North Pole, and in it, Santa shared with O. the secret of how reindeer fly. (I won't divulge it. Santa asked us not to.) If the child in your life hasn't gotten such a message yet, you might want to head on over to this website to see if there's one waiting. I got one too, and apparently I've been naughty. But Santa says I still have some time. I'm bringing back the "post a day until Christmas" tradition here at Small World, hopefully chronicling our advent activities. I'm not sure I have enough clever ideas and fun to fill up the days, and there's a good chance this year's events will be very similar to last year's. But that's what tradition is all about, right?? We started off the season by trying to get a photo of both children in festive garb appropriate to send out in a Christmas card. I gave up trying for a professional portrait two years ago after all three of us left the studio in tears. We were semi-successful last year at home in front of the fireplace, so we began the day with both kids sitting on a chair in front of the Christmas tree. When that ended with both O. and N. in time out (after they started performing leaping face first dives onto and off the chair), we decided that we could probably get something decent on our trip to the live nativity and conservatory. They tend to behave decently in public. We arrived at the conservatory, and O. remembered being there for the butterfly show in the spring. A little boy was crying as he exited the building, and O. said "Mom, I bet he touched one of those cactus in that one room." 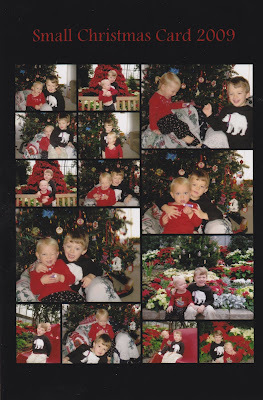 Several other families apparently had the same idea, as there were clumps of velvet clad children standing in front of every cluster of poinsettias. 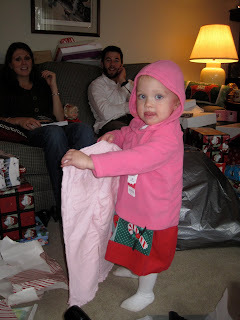 There was even a group in matching polar bear pajamas ranging in age from 6 months up to 12 years. The echoes of "Look Here!" "Say Cheese!" "Do You Want Some Fruit Snacks??" rang out throughout the greenhouse. I gave up hoping for smiles, and wished they would both just look in the direction of the camera. As we left the building, O. was the one in tears, because we declined to buy the coloring book he spotted in the gift shop. He didn't think it was too funny when I told him the kids coming in were going to think he touched a cactus. When I plugged in my camera at the end of the day to download and start sorting through the shots, there were 77 images. You would think with that many pictures to choose from, there would be at least one or two with card worthy shots right? You would be wrong. Labels: 12 Days, Christmas, O. and N.
Imagine my surprise this morning when I finished up listening to my podcast of This American Life and switched over to Science Friday, and I discovered that last week's show was all about They Might Be Giants' new album. This is not the first time I've written about TMBG on this blog. I also shared my delight at discovering them in song on the dearly departed Pushing Daisies way back when. TMBG is the band version for me of an long lost old friend. When they come up on random rotation on my ipod, I'm always nostalgically pleased, like coming across someone from your past you didn't realize you'd be so tickled to find on Facebook, but certainly are. When I find myself rocking out in the kitchen to the likes of "Particle Man" or "Don't Let's Start" and J. happens to be in the room, he just rolls his eyes. Yet more proof that it is a good thing he and I did not meet until well past adolescence. Guess his car stereo was tuned to Rush and Van Halen in the high school parking lot, not TMBG and the Violent Femmes. This is so exciting for me, the secret science nerd. I've always loved the science themed songs in their repertoire, including "Mammal," "Dinner Bell," and the one about the sun being a "mass of incandescent gas." Turns out, the sun isn't truly made of gas, so they've rewritten that last one and turned it into "The Sun Is a Miasma of Incandescent Plasma." *One of the tracks is titled "I am a Paleontologist" so I think I can get by with making this a Christmas gift for O.! I just finished reading the book Garlic and Sapphires by Ruth Reichl. This is not a new book; it was published I think in 2005, but somehow I missed it when it first came out. (Yet another victim of the the fourth trimester fog after my son's birth?) I'd been meaning to get to it, but for some reason it kept escaping my notice. Then I read the news that Gourmet magazine was being shut down and it got me thinking about Ruth Reichl again. I had read both of her previous memoirs, Tender at the Bone and Comfort Me With Apples, and loved both of them. It's been long enough ago that I'm vague on the details of either of these books, and could benefit from revisiting them, but I know that Reichl excels at bringing memories of eating to life, and expresses a true passion for food and its place in our experience. Her books are funny and touching, full of stories about the ridiculous (and often verging on poisonous) dishes her mother made when she was growing up, and Reichl's own adventures with vegetarianism in 1970's California. Garlic and Sapphires focuses on Reichl's decade long experience as restaurant critic for the New York Times. This is such a high profile job that she realized that she could not have an honest experience at any restaurant if she dined as herself. Therefore, she developed elaborate disguises and alter egos in order to eat as the general public might. The book is filled with delightful descriptions of meals in what are arguably the best restaurants in the world, and of course this made me happy. However, what could have been solely a book of bragging about phenomenal dining experiences instead becomes what I think the best memoirs are, an honest and revealing self examination. Each of the characters that Reichl creates is in some ways a reflection of a different aspect of her personality. Along the way, she discovers parts of herself that she wishes could be present more often in her everyday life, as well as disagreeable traits she has let grow far too large. As a reader, I found myself wishing that I too, could escape under a wig for a time to see what it might show me about myself. Reichl was well known during her stint at the Times for not giving renowned restaurants a pass simply for their reputation. She sought out "ethnic" cuisine before it was hip, and pointed out when service favored only elite patrons. It was very interesting to me to read about the restaurant scene in New York just as the "celebrity chef" phase was beginning. From what I've read about Reichl as the editor of Gourmet magazine (sadly, I can't say I was a reader or subscriber, and thus, perhaps am complicit in its demise), she brought a similar approach to that icon of the industry, highlighting accessible yet quality cuisine, and encouraging the locavore movement. Reichl, from what I know of her from her writing, cares about food deeply and passionately, yet is no snob. It seems to me that this is exactly what I want in someone who influences trends in restaurants, cooking, and food in general. So, I sincerely wish Ms. Reichl best wishes and success in finding her next endeavor. P.S. Oh, and speaking of food and celebrity chef culture, any bets on who's going home tonight on Top Chef? Forget the Edward/Jacob debate. I'm on Team Kevin. Anyone who says "I didn't get fat on accident. It was a personal choice" kind of rocks, if you ask me. Is it just me, or does this time of year really make you hungry for the foods of your childhood? I think it's the smell of celery and onions sauteeing in butter that gets it started for me. Early every Thanksgiving, right around the same time the Macy's parade would come on, my grandma would be stirring up those vegetables, while my cousin and I finished tearing up bread and putting it in the lid of the roasting pan. Probably it wasn't actually butter she used, but sticks of margarine (or 'oleo',as she calls it) instead. Ever since then, that specific aroma takes me right back to all those happy holidays spent with my family. Certainly, I'll be making some of the traditional cookies and candies I always make over the holidays, but lately my mind has been on the more everyday foods of my childhood. My mom's spaghetti meat sauce, meatloaf (I always wanted the end pieces) and German potato salad. A ham steak served with baked potatoes. The grape juice my grandparents canned using the grapes from their own backyard arbor, and we mixed with lemonade. The noodles my grandfather rolled out on a tablecloth until you could see the strawberries printed on it. My aunt's homemade Chex Mix, always served out of a gigantic Tupperware container, always with about three times the spice and butter the recipe calls for. For Thanksgiving this year, I bought what I thought were frozen dinner rolls, but was actually frozen dinner roll dough. Fortunately, I realized it in time to thaw the dough out and let it rise, and O. pronounced the end result "the best rolls in the world." I wonder if these will remain in his memory, like the loaf of bread my grandma made one rainy cold summer evening I was spending with my grandparents and cousins at their cottage remains in mine. My mother used to use frozen bread dough to make caramel cinnamon rolls probably once a week or so when I was growing up. She made the caramel sauce right in the cake pan she would bake the rolls in, setting it right on top of the stove burner to melt the brown sugar and butter together. She timed the baking so that they would come out of the oven right as dinner was over, set pan over a plate and carry it to the table. Each of us would sit there reaching for roll after roll, usually slathered with some butter that melted right on the warm roll. My brother and I would rub the side of the roll not covered in caramel directly into the remains of the carmel sauce on the plate. We'd usually polish off the whole pan right there at the table, because they were never the same any later than that. I'd been thinking about those rolls, too, so I just made my own pan of caramel rolls using the remaining bread dough from last week. I have my doubts they will taste as good as the ones in my memory. I can never get the caramel quite right -- it turns out grainy, not smooth and sticky. I have a feeling I don't use enough butter, but it could just be that nothing ever truly lives up to a food memory. What about you? What are the foods you fondly recall, or try to recreate from memory? If you will remember, dear old Scout recently had some mild health issues. Our carpet is a little worse for it, so we purchased a carpet steam cleaner (Used the $100 rebate coupon I got at BlogHer from Bissell! Already got the check back!). Haven't used it yet, but it's sitting in the dining room. N. likes to climb on it. O. likes to tattle. "Mom! N.'s standing on the pee cleaner again!" N is babbling in a very cute way about something, and getting enough attention that she keeps saying it: "N., let's stop talking about this already!" "Everyone knows that the world turns around and around." "Mom, did God make even the dogs? Does Scout know God?" "I love you bigger than our whole house. I love you bigger'n the whole world." "When you put your arm around me, that's called snuggling, right?" "Can you believe it is October? And summer is gone? It is almost Christmas! Well, it's almost Halloween." "What is spring all about? What is autumn? Why did they name my friend Autumn, if that's the same as fall?" "Mom, maybe I should just have a video with me while I'm at school. Then I won't have to tell you all about it." "We're having story club over here! (Begins to look at a book with his sister) Mom! N. knows what purple is! 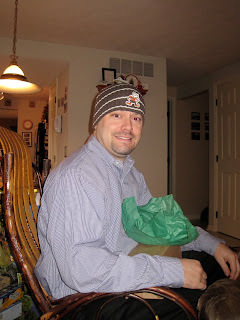 And a hat! Okay. Story club didn't really start yet. I'm teaching N. some things over here. (Two minutes pass.) Okay. Story club is starting! We're about to read! You don't want to miss it, do ya?" "Mom, what do you think we should do at the end? You know, when I don't have to go to school anymore? No, when I am all done with school and am a grown up. What should we do together then? It's okay. We have a long time to think about it. I'm still just a little kid." So, J. 's been traveling for work since Monday , and isn't due back until after kid bedtime tonight. Although we've had a good week, with good weather, mostly good attitudes, and no illness (yet), it's still been awfully long. Haunting most of the week has been a steadily growing case of H1N1 anxiety. I've been trying really hard to keep myself from being overly influenced by media hype, and generally creating a situation for myself where I am preoccupied with and panicked by something that is almost entirely out of my control . However, the case where a five year old died in the town where my parents live has been FREAKING ME OUT and I'm not being as successful keeping my mind off of it as I'd like. He had a mild case of asthma. Like a certain two year old girl who lives in my house. And my son's best friend from school went home from school yesterday, took a nap (which he never does) and woke up with a fever. I am not even done with the laundry yet. But I've decided not to hold myself to too high a standard today, with the hope I can just make it through. Everything is Pass/Fail today, and I'm really hoping for the "C."
FAIL: Eat some hearty fiber cereal, so at least we'll FEEL healthy. I bought this at Trader Joe's, a store I love but that is not close to me. The cereal itself is a grains/puffs/twigs mix, slightly sweetened and is not that bad. It's the Whole Grain Drink I bought to eat it with that I am giving a big fat "F". I don't think I've mentioned here that one of the few bonuses to N's allergy diagnosis has been my own discovery of rice milk. I can't do dairy products myself, and anytime I had ever tried to substitute soymilk, I felt vaguely ill. I always assumed it was psychosomatic, but still, usually ate cold cereal with water on it. (I know. Gross.) But when N. was on rice milk, I tried it myself, and found I felt no odd tingling like I did with soy. So now I'm a rice milk convert, and eat cereal almost everyday. When I saw this Whole Grain drink at Trader Joe's alongside the other alternative milk products, I thought I would give it a try. Bad idea. It tastes like you would expect perfume to if you drank it. Dumped it right down the sink, without even trying to use it in some other way that might make it less offensive. It was that bad. Hope the TJ brand Rice Drink isn't as bad, b/c I bought two cartons of it. FAIL: The huge pack of bendy straws I bought at the grocery store for $1.99. They are way thinner than the old ones I had, so that they will not puncture the foil of a drink yogurt top without bending and splitting. So irritating, yet I probably won't throw them out. FAIL: My favorite knife, which has become very dull recently. I know I'm probably going to get cut badly with it soon, and chopping vegetables, a task I usually enjoy, has become a pain. However, I have yet to figure out how I'm going to get it sharpened. Nowhere in my normal shopping radius offers this service, and what, I'm going to stick my 6 inch chef's knife in my purse along with the diapers and fruit snacks and take it into the mall with me, two kids in tow? FAIL: Moose A. Moose singing "Believe in Spring" on the Preschool on Demand channel. This channel often gets left on in the background when the kids are romping around, and there's a loop of clips from the available programming. I'm sure my subconscious has it memorized. And isn't it time for spring to have come and gone?? How about a little ode to fall or something?? PASS: The Monster At the End of the Book: Starring Lovable, Furry Old Grover. One of my own personal favorites growing up, we have had this book for probably two years, and O. has always liked it. However, it had gotten lost in the jumble of books for quite a while and just re-emerged yesterday. Since then, we have probably read it at least twelve times. O. laughs hysterically every time. He's finally caught on to the humor, absurdity, and general naughtiness that the book encourages. He thinks it is hilarious to turn those pages, exactly as Grover is instructing him NOT to do. A delightful diversion. PASS: Cherrybrook Kitchen Arthur's Chocolate Chip Cookie Mix. (yes, the PBS character is on the box) Cherrybrook Kitchen is a company that makes Peanut Free, Egg Free, Dairy Free bake mixes, and this is the one we've tried most recently. Just had to add a stick of butter and some water, and they cooked up really nicely, fluffy and not flat! The kids helped roll them and put them on the pans, and watched them bake as well. "Mom! The balls are almost flatted out! I think they are done!" Quite yummy, too. PASS: Bungee cord and a roll of plastic craft twine for toys. O. has amused himself for good long stretches of time with these. The bungee cord is a tiny one, taken from his dad's tool box, and works well to create all sorts of traps and contraptions, or simply to connect two stuffed animals together. The twine was a finish line, necklace, and net in the half hour before N's nap today. PASS: The prospect of some shows my husband and I will enjoy watching together stored up on the DVR. We've got House and Amazing Race and How I Met Your Mother and Top Chef waiting for us. To quote Barney Stinson: "Awesome!" And this evening, while we watch, Flash Forward, The Office, Grey's Anatomy, and Fringe will all magically be recorded. I heart television, and I'm not all that guilty about it. I mean, how awesome was that Sweet Caroline serenade by Puck last night on Glee? INCOMPLETE: My Kindle is broken. Acting very weird when I turned it on this morning in anticipation of taking it on our car trip tomorrow. Can't tell you how much this bummed me out. But... I called the customer support line, and after only a five minute conversation with a real person, a replacement is on its way. As long as it arrives tomorrow as promised, this will very much be a PASS. Great customer service is so hard to come by these days. Okay. I may actually be standing in line at a health department two counties over tomorrow trying to get the kids vaccinated and imagine it will potentially take hours out of our day only to be possibly be turned away because we don't actually live in the county. (I recognize that this makes me sound crazy and desperate. But what else am I gonna do??) That means I HAVE to go pack. What makes the difference between a Day full of meltdowns, drama and all around screaming and a Day that sails smoothly from breakfast cereal all the way into naptime and beyond, ending in a pronouncement "It was a great day today" from your son? Nothing. Not so far as I can tell. There are times when I fool myself into thinking I might have a clue about this parenting thing. Just one or maybe two. For example, my husband will do something tricky like pretend to put another cupcake on my daughter's plate when she's screaming that the one that is right there in front of her is no good at all, not like those other ones, those blue ones that only SEEM to look the same over there on the serving plate. And she will fall for it and stop crying. And my husband will say to my mother: "I learned that one from E..."
I will feel so proud of myself. Like wow. I hold the secrets to making my irrational children happy. On an evening such as this, my children will charm the pants off of every other adult in the room, chattering up a storm, saying all kinds of precocious and adorable things, hugging and consoling each other about some cute fear. J. and I will remark on the way home "Who were those kids? They were nice." But then there's the next day. Those same children will inexplicably morph into children that cry for absolutely no reason other than the straw is not sticking out of the cup at the right height. And I will suddenly be the mother that can't remember that this is the child that needs the water put in the sippy cup before the juice, not the one that needs it poured on top of the juice. I will be unable to figure out if my son is crying because he didn't get his own red slush from Sonic, or because he has a bad teacher this year at preschool. Everyone will cry all day long. Not even because I am the one who is tired, or bored of playing dinosaurs and babies, or missing an adult to talk to. Because those things happen too. I understand on those days that I'm the one that's a wreck, and I yelled too much or put off paying attention for a little too long and upset the order of things. Helped to create the general sense of chaos and dismay that color our days. It's the days that I'm willing to go along, willing to console and empathize, create diversions and projects and we STILL have a bad day that confound me. I know. They are bored, tired and frustrated themselves. It's no easier to be four or two than it is to be thirty-six. But can't we sometime, sometime, coordinate our schedules and have our good days and bad days together? Dear N., You Know You're the Second Child When Your Birthday Letter Arrives More Than A Month Late. 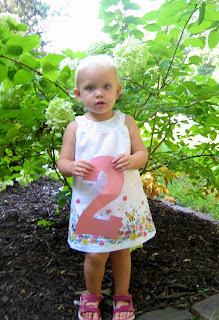 In celebration of your second year of life, if not your actual birthday, some thoughts. There is so much to say about you and who you've become, how do you put it all in one letter, one page, one anything? What I know is that you are a delight, just as you've been since the day we knew you would be a part of our family. You've been through an awful lot this year, things that could keep just about anyone down, but you've emerged from all the itching, the food restrictions, and the rounds of doctor visits with a winning personality, a real ability to connect with other people, and with the world at large, a sense of humor and air of joy that sparkles right out of those eyes, those blue blue eyes. "I thought my little girl smiled a lot, but man. She has an amazing smile. She just grins through the whole class. Has she always been like that?" The dad in your music class asked me this question last week, and I immediately answered, "Oh yes, she's always been my happy baby." Maybe it's not exactly true that you were always happy. I look at photos of you during that rough patch in the winter and spring before we got a handle on the itching and the swelling preceding your allergy diagnosis and it is clear that at least some of the anxiety I felt got transferred to you. It was the not knowing how to help you that was hardest on us all. Now, that we have clear answers, and plans for treating you, it seems the only restrictions on your enjoyment of life are the few foods you can't eat. I watch you slide face first down a slide on the playground just for the pure joy of it, chase after your brother and the other big kids in tumbling class as fast as your feet can run down the tumble track and jump with NO fear off the end into the big padded "pool." I watch you clap your hands and twirl, and sit right in the middle of the story blanket at music class. I watch you laugh with abandon as you make some funny motion that will delight your brother. I can hardly remember a time when you weren't this delighted with life on a regular basis. You are so much more willing to engage with new situations than your brother ever was, and I love the way you participate in life with so little anxiety. I wouldn't call you gregarious, as you still have to check to see if I am close by, and come back over for some "up" time in my arms after you dance, wave hello to a potential new friend, or show off your newest "Shortcake" doll. "Hi Mommy, hi. Munning." I get the distinct impression that nothing could thrill you more than to see me, and I don't think I have to tell you how amazing THAT feels. Oh, you are not all sweetness and light, not all sugar and spice and everything nice. I don't know whose little girls are made of all that. No, you're pretty darn demanding, and have the shriek to prove it. The facial expressions and gestures still go a long way in this regard. Yesterday, you shot me the evil eye right out from underneath your eyebrows. 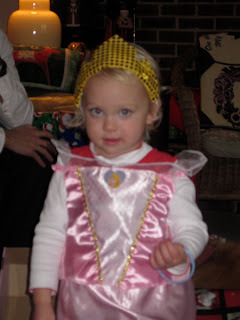 Also, when you recovered the princess book your dad and I told you was missing (we really didn't know where it was!) from underneath the coffee table, your dad tells me the look of 'how-dare-you' triumph on your face was unmistakable. And if something is smelly, or messy, or otherwise potentially off-putting, you loudly proclaim "Ewwww. Dohhss!" with a definite crinkle of the nose. You are a girl, there is no mistaking that. Ponies, Strawberry Shortcake, stickers, stuffed animals, and babies, always the babies. These are your favorite things, and you actually play with them on your own. You fill up your purse, ask for crayons to color in your Little People book (Girl. Girl. ), then make me tea and plastic hot dog soup. And then, because you are lucky enough to have a big brother, you go pile up some dinosaurs and cram as many marbles and bouncy balls as you can in your purse on top of the ponies and hair bows. O is still your very best friend, and you are missing him when he's at school, so much so that you often squeal and run to hug him when he comes out of his classroom at the end of his day. But it is clear you are loving having some time on your own, for you and I to go to the grocery store together, sit at the table and play with playdoh, or just snuggle in a chair and eat dry cereal out of a cup. I am so glad I get to be your mom. Happy Belated Birthday, sweet girl. Yesterday, I actually had the local news on for a little bit in the evening, just as the weather report came on to inform us that O's very first field trip, a visit to the pumpkin farm for a hayride, will most likely be accompanied by by rain and mud. We had some discussion about the fact that he would most likely get to wear his boots and raincoat. Today, the rain arrived a little ahead of schedule, and as I was wiping the dogs paws off, O. looked thoughtfully out at the rain splashed driveway. I thought he was getting concerned about the pile of berries he had plucked from our burning bush and left for the birds, but instead, he asked, "Mom, how do the weather people know what is going to happen? Is it just a lucky guess?" I explained that they study the wind and the clouds and what's going on in the rest of the country and that they use their computers help them figure some of this out as well. "Oh wow. That sounds really cool." "Do you think you'd like to do something like that someday?" I asked. Well...it does sound cool, but also really hard and tiring. Do you think they ever get to sleep?" I tell him that one of his friend's mommy does this for a living, and remind him that he's seen her on TV before. "Oh. Yeah. And does she get to have a drink? And eat something sometimes?" I can barely remember a time when I didn't call myself a writer. I've been scribbling stories since I was a kid and ripped off the plot of "The Popcorn Dragon" (a lame story I read in school) and called it my own. I've written plays for puppets, scripts for magic shows, and newspapers with single copy subscriptions. I've kept journals off and on, written short stories and essays about my life. When I was a teacher, I was most energized when I was helping students work through the painful process of writing. For a two year period, I even worked at a serious level on a book of poems, and emerged with a degree in creative writing. I still claim the title of poet, though I haven't written a single line of verse in six years. I call myself a writer, because I think in terms of character, voice, and phrasing. I understand the world through metaphor, often living figuratively instead of literally through struggle. In my teaching history, I've come across many who were afraid to claim the title of writer, afraid to let their own voices be enough to share their experiences. So maybe it's my training to encourage reluctant and timid writers that allows me to so freely call myself a writer. After all, I've been telling my story my whole life on the page, what else would I be? However, there's always been a disconnect between my willingness to claim the role of writer and my ability to maintain it as a constant in my everyday life Writers when interviewed always talk about the urge to write, the compulsion, the hunger, the NEED to get words on the page, to create, to tame the beast that compels them to listen to the characters or the ideas that are speaking to them in their heads. While I recognize I'm lacking the ambition and drive that would push me out into the frightening arena of publication, what's more puzzling is that for much of my life, those beasts and voices simply haven't been hounding me. I could go long stretches, years even, without writing anything of real substance. Part of it was that I never saw a purpose to what I was writing. I'd jot down a scrap of this, an encapsulated essay on that, a line or two that really captured the essence of how I was feeling at a particular time, and then the blank book I'd started would be abandoned until I had to do a timed writing assignment along with my students, wherein I'd jot down another thought or two. But they were all jumbled up, no real order or direction to any of these ramblings about myself, and certainly no audience. For that is something we discussed a lot in my writing classes. Who is your audience? What are you writing this to accomplish? And the answer to that question was always 'I have no idea.' So the blank book would get put on a shelf, until I got another one as a gift, and the process started anew. Until that is, until I found this blog. And suddenly, there was a format that fit exactly all the writing I'd been doing all these years. Certainly, it's not as polished as the writing I did back when I was a practicing poet, but then I had a workshop to answer to, and an assignment every week, and time and reason to revise. But every day, I flip open my laptop, and staring back at me from the bookmark bar is the title of my blog and the reminder that I probably didn't write anything yesterday, or the day before, or maybe even the week before. And while there are not so many of you that make up my audience, there are a few, and so I feel an obligation again to produce. If only to gain the satisfaction of a couple of written comments, or the idea that my husband who is traveling will have a concrete way to participate in the activity Small World while he's absent, more fleshed out than I'd be able to convey in a phone call. And certainly, it's for me, as well. The days I can compose a post and actually get it on the blogger screen are days that I feel like I've won the battle against entropy that is raising small children. I don't achieve poetry here, not that often. I don't even get half of what I'd like to write down. There are times when I get so overwhelmed by the fact that I've missed so many moments that I wanted to digest, crystalize and treasure that I can't even write a single word. But always, I am drawn back in, beckoned by the blogs of others that I read and am in awe of, ones that can coax beauty and sense out of almost every single day in the form of a post. There are times when keeping a blog seems far too much for me. I get a sick headache feeling when I try to figure out where in the day I'm going to carve out the moment to do some writing other than in my head. But guess what? I'm writing in my head. That sick headache, I fear, means I'm becoming even more the real writer I've claimed to be for so long, but was secretly afraid I wasn't. The beasts whisper to me in the night of posts I'm supposed to be writing. The voices of my children, my characters, long to speak from the screen. So many of these ideas and stories have slid away from me before I've gotten there, and I feel actually sick about it. Today I realize that this means I'm doomed. Doomed and compelled to continue to be a writer.